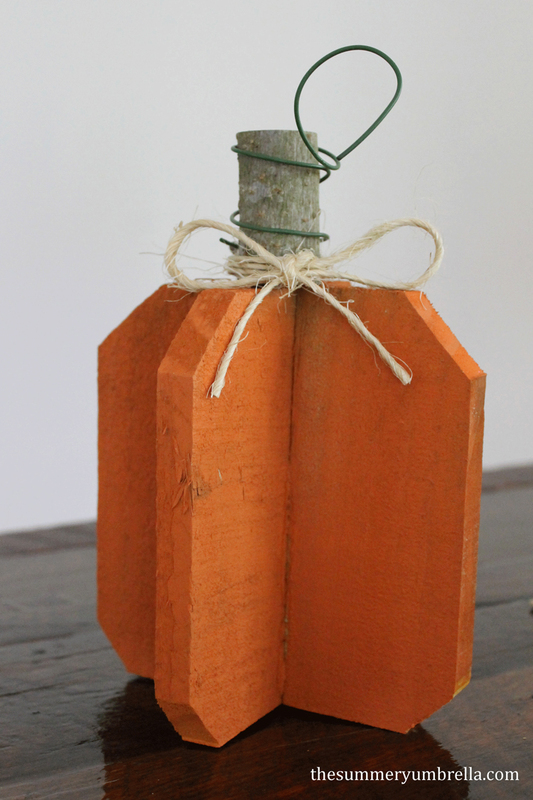 DIY reclaimed wood pumpkins are not only incredibly festive for Fall, but super simple to make as well. 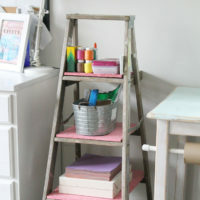 Check out this step-by-step tutorial to see how! 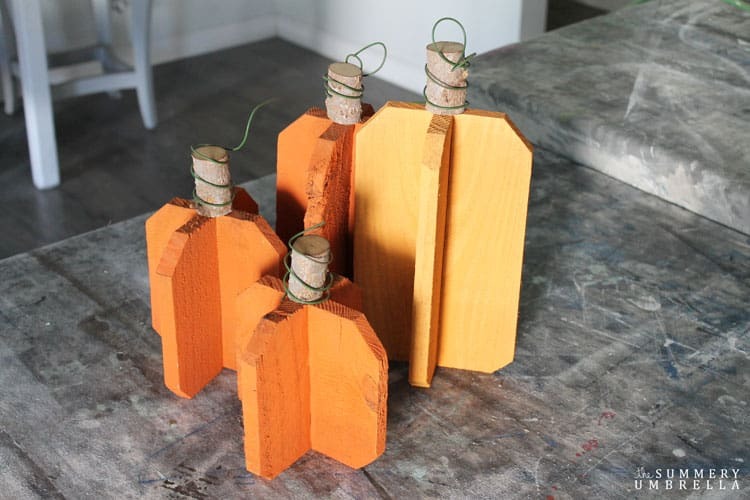 With being said, today I’m sharing a super easy way to make a few of your own DIY reclaimed wood pumpkins for around the house during this holiday season. It honestly requires no special skills, and can even be accomplished in a variety of ways. It just depends on what tools you have at home. Let’s talk wood first. Yesterday I shared the beginning stages of the clubhouse that Mike and I are creating for our little birthday girl (she turns 3 tomorrow!). We’re using “new” wood for the frame to ensure the stability, and like any project there’s a lot of glorious scrap pieces. Yay for me! 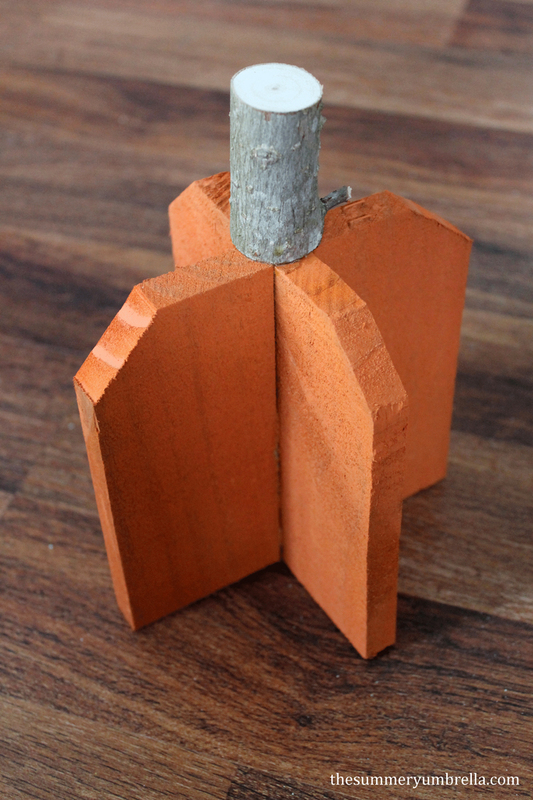 For this project you can pick any type, shape, size, etc of wood. Just make sure you have two pieces for each pumpkin that you would like to make. 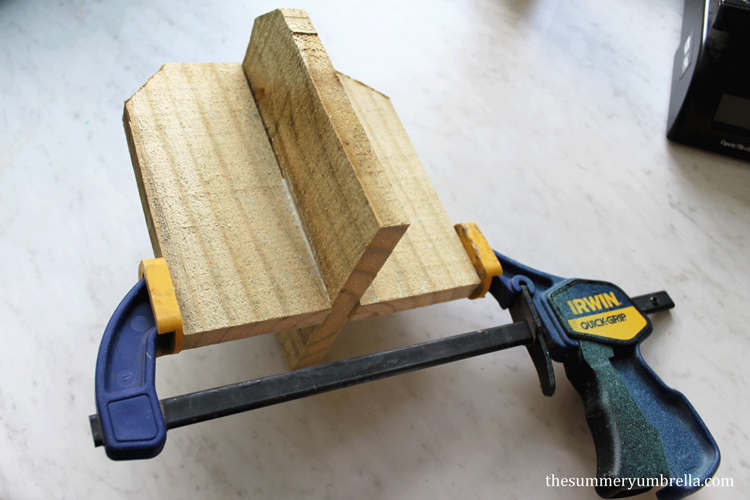 Next, cut one of the wood pieces in half using a miter saw (or you can use a hand saw). 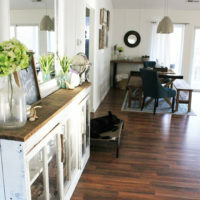 Using wood glue place each piece that you cut on the whole wood board directly in the middle like in the below picture. 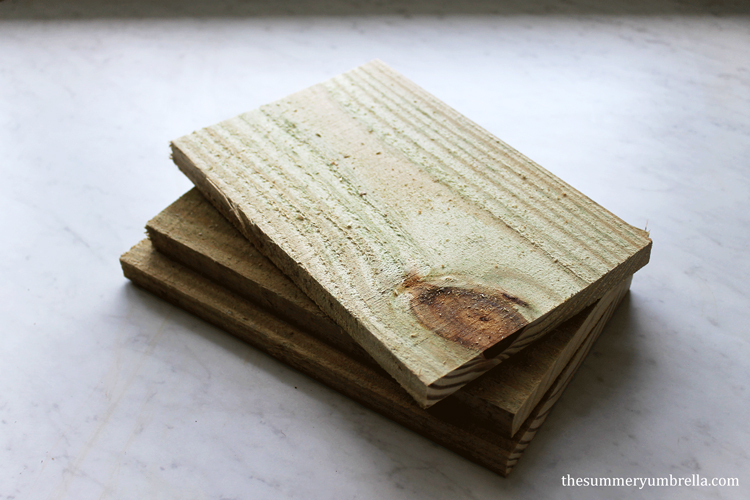 Note #1: You do not have use a clamp to get these boards to dry/stick together, but it will help. This particular pumpkin I was creating wasn’t very even so there were gaps in between them. Note #2: The wood in the below image that I was using had notches cut out of them already at the top, but on a few of the other pumpkins that I created I had to cut them out myself. Also, after I put my pumpkin together I realized that the notches look great on the bottom as well. To save yourself time cut the notches out of your wood prior to glueing them together. 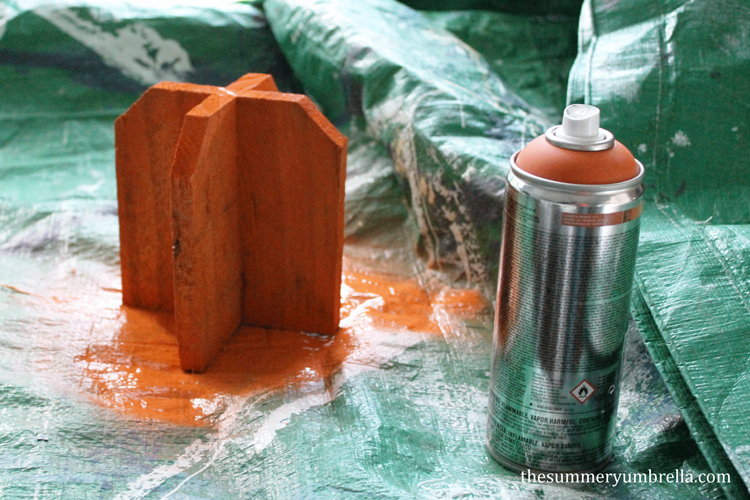 After your wood is good and dry go ahead and spray paint your little pumpkin any shade of orange you would like (or really any color!). While I was waiting for my pumpkins to dry I cut a piece of wire for the “vine/leaves”. I didn’t measure this piece out, but it’s probably around 12″-14″ long. 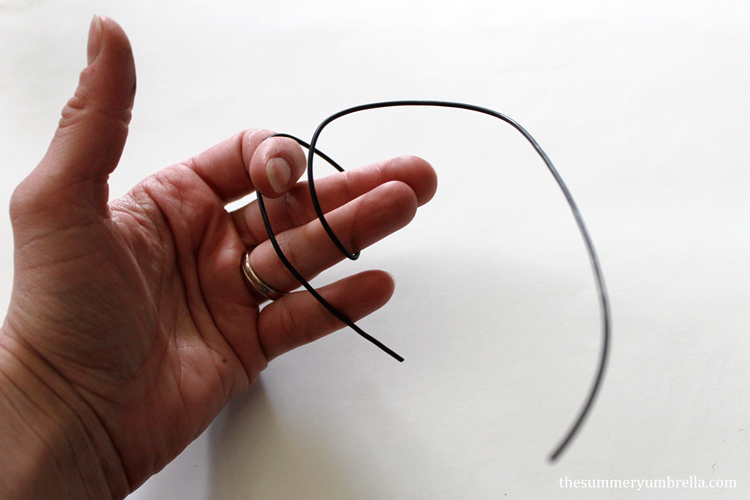 As shown in the below image I twisted the wire around my fingers to give it a swirly shape. After you have shaped the wire to your liking (it doesn’t have to be exact at this point) I went ahead and spray painted this cute little thing as well. Once everything was good and dry, and I was satisfied with the color I cut a little stump off of my tree branch. Again, I don’t really think it matters what size it is. Just as long as you like it! Then, go ahead and wood glue it onto the top of your pumpkin. 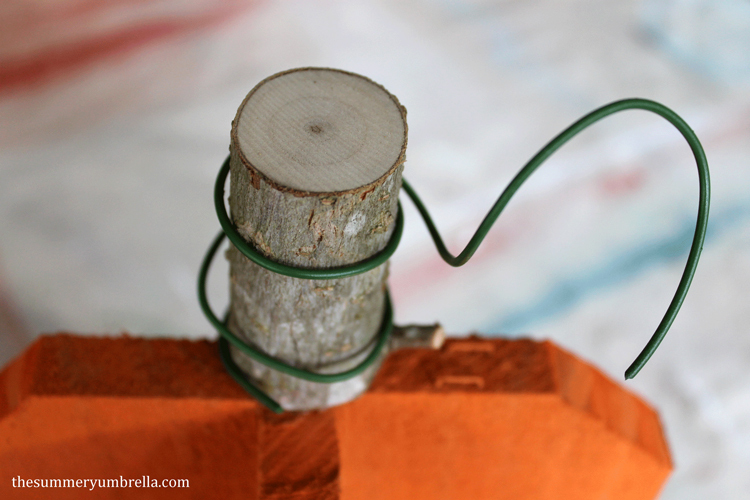 Finally, after your tree branch stump has dried go ahead and twist your wire all around your DIY reclaimed wood pumpkins to your liking. Viola! A beautiful wooden pumpkin! 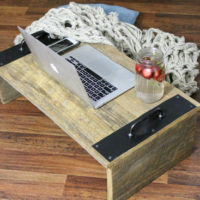 If you’d like you can even add a twisted rope/twine bow on top to add a little bit of flair. 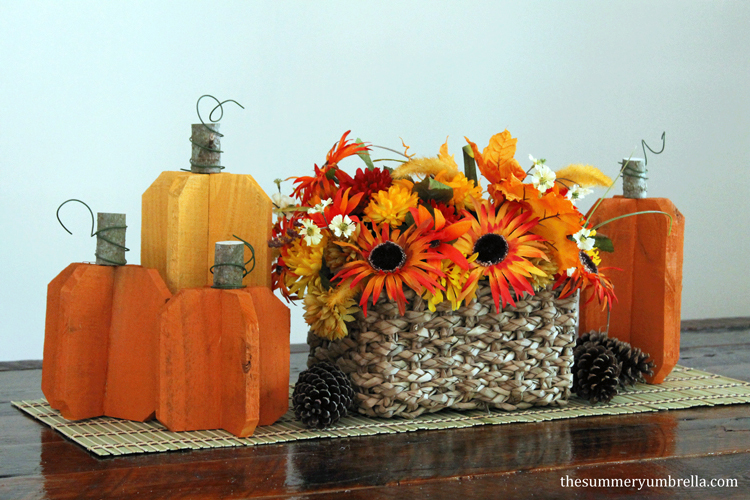 Aren’t these DIY reclaimed wood pumpkins adorable?! ?Mix and match the sizes as well as the shades of colors, and they’ll look great as a table centerpiece, outdoors, in the bathroom or wherever you need a little color in your home. So cute! :) I hope you have a great weekend, and see ya next week! Adorable!! I’ve never seen these before, love them. Thank you for the compliment and stopping by! Do you happen to know the measurements of the wood when you started on the small orange pumpkin? Hi! The small pumpkin (without the branch stem) is approximately 10″ tall. Hi Lz…really like the pumpkins…can you please tell me if you trim some off the vertical sides of the 2 pieces that you have cut apart? As in, do the pieces that you glue on stick out a little further than the centre uncut piece? Thanks! Hiiii love these and am making one as we speak!! You don’t happen to know what yellow paint you used?…same brand as the orange?